Text Dash: Science Fiction: What’s in it for Urban Fantasy fans? 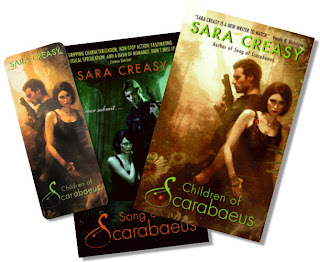 Science Fiction: What’s in it for Urban Fantasy fans? I'm guest blogging at Literary Escapism today. The theme du jour is "Science Fiction: What’s in it for Urban Fantasy fans?" If you're put off sci-fi by the impression that it's all tech-talk and ray guns, think again. UF fans may find much to like about gritty, action-packed, character-driven SF. Enter over there for the chance to win a set of both Song and Children of Scarabaeus, along with a signed bookmark.